Dominiks technics to put forward the violent scenes is extremely realistic. I even had difficulties to watch them. One feels every punch, every broken jaw, every broken nose and every lost tooth. He uses extreme slow-motion and supremely particular music. During the entire Film one can watch those terrible long scenes, prolonged discussions between two men.There are several long depressive monologues about how fucked up life is. At the beginning, one thinks that the scenes do not make any sense, but then they stay in your mind just for hours. The movie is not comparable to any other gangster movie (there is probably a bit of Tarantino in it, but in a very small dose). It has nothing to do with Goodfellas or Godfather. It is not just any traditional gangster film. There is a lot of smart dark humor which makes the film a bit less serious. An interesting and even important subject in the motion picture, is the financial crisis from 2008 and the problems in the American society. During the whole movie one can hear speeches from Barack Obama or George Bush. At the end, the whole American system is criticized. Jackie Cogan is a cold opportunist looking out for number one. Frankie is a fidgety chancer down on his luck. Russell is a junkie always cooking up harebrained schemes. Mickey is a depressed alcoholic with a penchant for prostitutes. Brad Pitt once more shows what a talented actor he is. He is ”the man’‘ himself. Probably one of the few legendary actors comparable to Brando, Dean or Newman. The other actors: Scoot McNairy, Ben Mendelsohn, Richard Jenkins, James Gandolfini and Ray Liotta are excellent. The biggest impression left in my mind is the music in the film. Dominik chose the music ultra carefully. From the beginning on (even the trailer) the music fits perfectly to every scene and makes it sometimes strange to watch. It releases a truly special feeling. A film to watch! 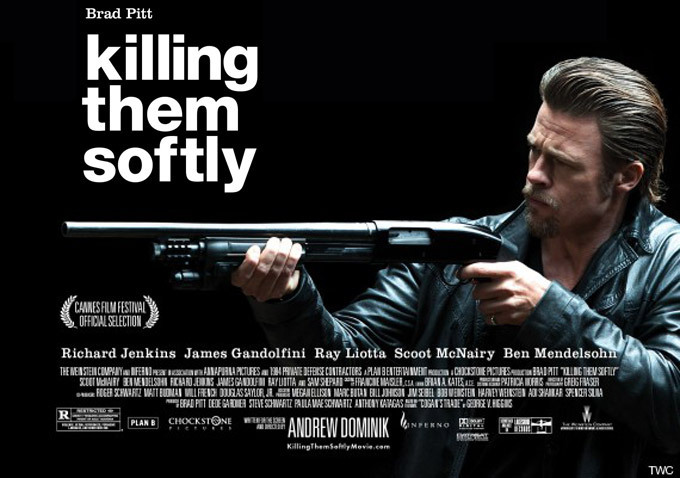 This entry was posted in Cult, Film, Uncategorized and tagged Andrew Dominik, Ben Mendelsohn, Brad Pitt, Cannes, Cinema, Drama, entertainment, Film, Film Festival, gangster, James Gandolfini, Killing them softly, Motion Picture, Movie, obama, Palme d'Or, Ray Liotta, Richard Jenkins, Scoot McNairy, society, Tarantino, USA. Bookmark the permalink.